One day, probably quite soon, most kids will be getting their pocket money in digital currency and skilfully using it for in-game purchases, tipping buddies on reddit and other really cool things which have yet to be invented. Currently, of course, most kids are still raiding their parents’ pockets for a few units of their local fiat currency. Yet there are a few enterprising youngsters here and there who have already discovered the advantages of bitcoin, are using it, and are even making generous amounts of pocket money from it. 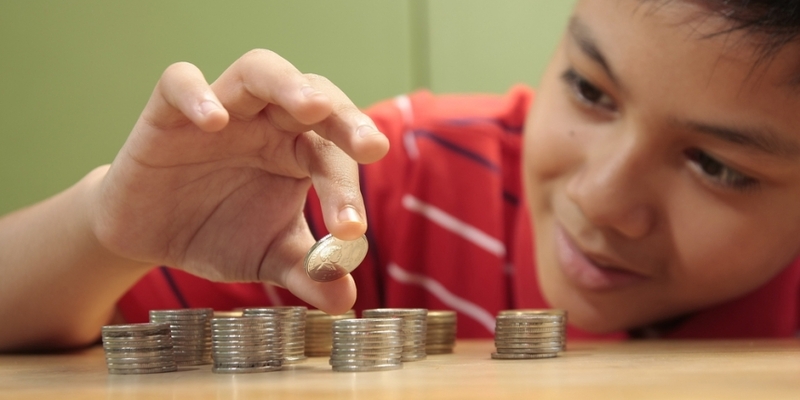 In this article, CoinDesk looks at the kids that are making the most of bitcoin. Hailing from Cache Valley, in northern Utah, three brothers between the ages of 11 and 15 have their own successful honey business at home in the Cache Valley. It all began when Nate, Sam and Ben Huntzinger caught a swarm of bees as an experiment. Little did they know it would lead to a small business and an obsession with bitcoin. Their father, Craig, says they had no intention of starting a business. “As we started working with honey and beeswax we started making new things for ourselves, and eventually got a small business licence, more honeybee hives, and started selling our items at our local Farmer’s Market,” he said. They heard about bitcoin in 2011 and were instantly attracted by the concept of a decentralised, non-inflationary currency. The ideals behind bitcoin seem to align with those of the Huntzinger family. The answer is a flourishing business and three boys learning about finance and investing before they’ve even finished high school. Business is booming. From selling pots of their honey locally, their company, Bees Brothers now produces several different flavours of honey caramels, honey roasted almonds, beeswax lip balms and candles both at the markets and via their website. And all can be had for bitcoin, of course. If your children are confused about what bitcoin is and how to use it, then head right over to the BitKidz website where you’ll find a host of online tutorials, as well as the chance to buy a host of books (using bitcoin) that explain the subject. 30th May 2013 was a life-changing day for the sisters. That was the day they were introduced to cryptography by their Uncle I.J. 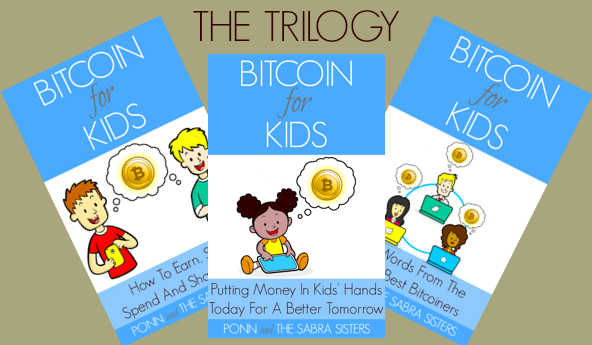 Aware that they were all successful juvenile nonfiction authors, he challenged the sisters to write a ’25 Fun Facts of Bitcoin’ book, which eventually evolved into the five-book ‘Bitcoin for Kids‘ series. They immediately started researching into bitcoin and, less than 24 hours later, surprised him with the launch of their brand new blog dedicated to learning about the digital currency – the first post being entitled, ‘Yes, we’re interested Uncle I.J.‘ The rest as they say, is history. Now the home-schooled girls justifiably boast they are “professional bloggers and bestselling authors”, with some credit given to their mother Ponn – also a blogging professional – for her guiding input too. Reddit user DorkusPrime came across young entrepreneurs Mia and Taylor in California back in January in the Noe Valley neighbourhood of San Francisco. He posted a photo of the two little girls at their cookies and lemonade booth and it quickly became something of a web sensation. 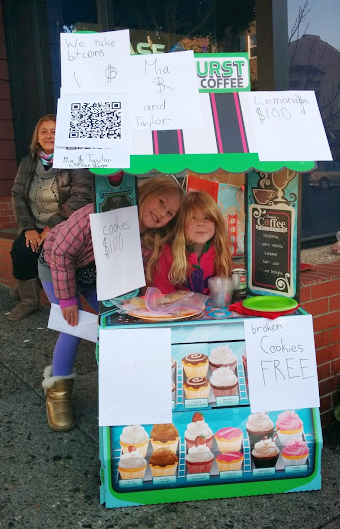 “These adorable little girls just sold me snickerdoodles for Bitcoin in San Francisco. I asked them to say cheese for the Internet :),” DorkusPrime wrote at the time. The girls were accepting bitcoins via the QR code plastered to the booth’s roof. And business was pretty good too – the pair told Foodbeast that they had made 0.083 BTC, which was around $70 at the time. Youthful writer, Jaden Shelton (A.K.A. the Bitcoin Kid) claims to be “the youngest author ever who has published a book offered only in bitcoin”. 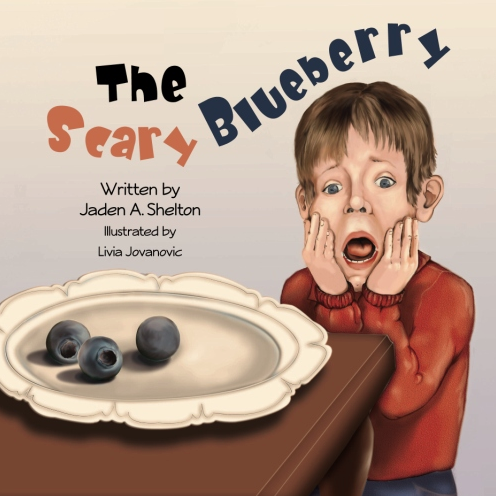 Published last year, when he was nine, his book The Scary Blueberry is the “ideal book for children facing new foods and new challenges!”, Jaden says on his online store. As well as being a self-published author, the Bitcoin Kid maintains a blog about aspects of bitcoin that interest him and as a platform for his videos. A promising TV presenter, Jaden has posted a series of videos in which he interviews key staff at prominent digital currency businesses, such as ripple, Mycelum and BitInstant. Andrew’s father, Steve, later told him about bitcoin and the schoolboy was hooked. “He was incredibly excited about it and asked if I could take his Apple stock and cash it out for BTC, so I made him a paper wallet and […] bought a bit at a time,” Steve wrote in a post on reddit. Andrew later told his teacher about his investment, revealing he had made about $50 since his dad bought him some bitcoins. He said he was originally thinking of cashing out 25% of his investment, but the savvy youngster decided to hold on to his cryptocurrency. Andrew wanted to do more than just a talk at school to get his peers involved in digital currency. 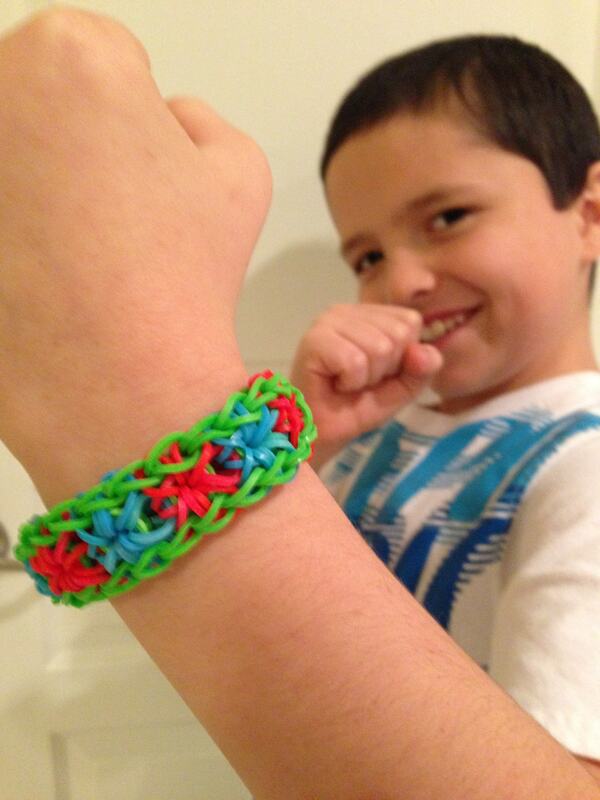 So he asked his father whether he could sell bitcoins to his classmates, then get them back by accepting BTC as payment for his Wonder Bracelets, which he makes from colourful elastic bands. With a few doubts, Steve set up an online store for the aspiring entrepreneur called Bracelets for Bitcoin. Andrew’s story and enthusiasm struck a chord within the bitcoin community, with some members of reddit making donations to the 4th grader. Steve said his son is “super excited” by all the support he is getting and even commented that he wants to be a “professional millionaire” when he grows up. 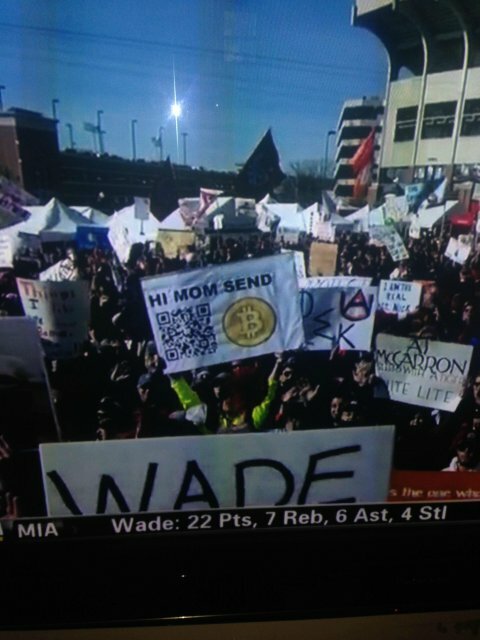 And finally, let us not forget the enterprising college kid who, in early December 2013, made it onto TV holding up a sign with a bitcoin logo and wallet QR code at ESPN’s ‘College GameDay’ game. After a little sharpening by helpful members of the public, a still of the moment made it onto the front page of reddit and caught the attention of the bitcoin community, who promptly sent him a flurry of donations amounting to over $24,000 in bitcoin, some of which he allegedly donated to Sean’s Outpost – a bitcoin-funded homeless outreach centre in Pensacola, Florida. This article was co-authored by Louise Goss and Emily Spaven.